raise awareness and improve water quality in the South Bay area. The Teach & Test Program monitors ocean water bacteria levels at local beaches to raise awareness and improve water quality in the South Bay area. The goal of the program is to involve the local community and raise awareness of the environmental challenges we confront at our local beaches. By doing so we hope to reduce our environmental impacts and improve the quality of our community. 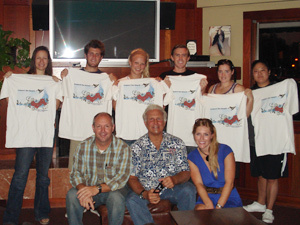 Throughout the school year (October through May), students from local high schools (Mira Costa High School, Redondo Union High School, South High School, and Palos Verdes High School) coordinate with dedicated Surfrider Foundation activists to collect bi-weekly water samples from 17 South Bay beach locations and the Ballona Wetlands. 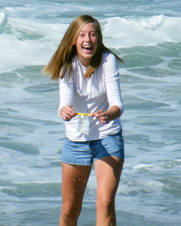 The water samples are analyzed at the SEA Lab in Redondo Beach with the oversight of an experienced lab technician. We engage in a program-relevant field trip and interactive social events during the year. At year-end, students present their findings along with creative ways to improve the results, one Teach & Test team from each school. We more recently teamed up with Redondo Union High School students and science teachers to conduct Waste Characterization Studies. Trash is collected at the beach where water samples are taken, then sorted at the lab to determine when the source of the trash (i.e. food wrappers, foam containers, plastic bottles, and various sports items). The goal is to reduce the accumulation of trash on our beaches by identifying and bringing public awareness to the sources that contribute to beach litter. A NRDC report, "Testing the Waters 2009," found that beach closures that result from polluted water continue to be a significant problem. In addition, water quality testing programs continues to be reduced due to budgetary constraints. The Teach & Test program fulfills an important role of raising public awareness of water quality issues concerning our local beaches. There are an array of volunteer positions available in our Teach & Test program. If you'd like to get involved, contact us and we'll find a place for you based on your interests and availability.